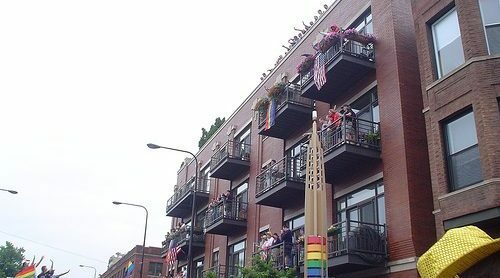 One of the first official LGBT neighborhoods in the US, Boystown never takes a break from being lively, bright and unique. It offers solid neighborhood amenities, shops and restaurants unlike anything else in Chicago, and streets full of nightlife that rarely sleep. As you’re moving to Boystown, you may head to a renovated historic home on a quiet side road or settle somewhere closer to the action. Wherever you go, you can rely on New City Moving to be the best Boystown movers. When you live in Boystown, you’ll join about 16,500 diversely-oriented residents. There are a few more men than women, and a significant number of families with children. People in Boystown generally earn over $60k a year, and have at least a Bachelor’s degree. Through the early 20th century, when it was more commonly known as East Lakeview, the neighborhood was home to large German and Scandinavian communities. The area became known for being gay-friendly in the mid century, and hosted its first Gay Pride Parade in 1970. The nickname Boystown followed shortly after. In the late 1990s, it was officially designated a gay village. Art deco style rainbow monuments were installed throughout the neighborhood around that time. They remain to commemorate Boystown’s history. Now you’ve got the gist, here are some highlights—and basics—we found to help you start your Boystown life. Space Park on Roscoe: Community garden. Northalsted Market Days: Massive annual festival. Chicago Pride: Annual, in June. Center on Halsted: Brand new space for LGBT community resources. Laugh Factory: Famous mainstream comedy venue. Annoyance Theatre & Bar: Decidedly non-mainstream improv and sketch comedy. The Leigh Gallery: Art for every taste and budget. Beatnix: Shop for costumes, wigs, vintage and more. Ragstock: New and recycled clothes, good quality and low cost. The Gallery Bookstore: Decades’ worth of classic reads and hidden gems. Pizza: Lark. TVs, board games, DJ. Open late. Tacos: D.S Tequila Company. Burgers, too. Patio. Sushi: Rollapalooza. BYOB, no hard stuff. Vegan Brunch: Chicago Diner. Delivers. Omnivore Brunch: Drew’s on Halsted. Great for families. Michelin Favorite: Wood. High value, high class. Shows: Kit Kat Lounge & Supper Club. Drag performances at dinner and brunch. Late Night: Lots of options after last call. Taco & Burrito Palace. Two of them. Nookie’s Tree. Classic American diner, 24-hr weekends. Community: Roscoe’s Tavern. Neighborhood’s flagship gay and lesbian bar. Rooftop: Sidetrack. Multi levels, including open deck. Game Watch: North End. Low key sports bar with specials. Game Play: Replay. Arcade bar. Local: Little Jim’s. Since 1975. Open late all week. Starting the Night: Dive Bar. 20+ daiquiri flavors, plus seafood menu. Dancing Late: Here are just a few. Hydrate. Theme nights and programs. Jewel Osco: Full sized, open 24/7. Whole Foods: Almost full sized. Treasure Island Foods: Local “European-style” chain. Mariano’s: Local chain with prepared foods. Peet’s Coffee: Chain with signature drinks. Coffee and Tea Leaves Company: Sell beans and teas. Next Door: Free meeting space sponsored by State Farm. Lakeview Athletic Club: Rooftop pool. X Sport Fitness: Full amenities. FFC Halsted: Full equipment and spa. Belmont Harbor Dog Beach: A walk that’s worth it. This has been a tiny sampling of the great things you’ll experience at your new Boystown home. As a seasoned Boystown moving company, we’ve learned all about the staples and cool places in the area. We’re happy to share more! As you’re planning your big move, cross one major thing off your to-do list, and book Boystown movers who’ll a take load of stress off your mind. Call us at New City Moving, and we’ll help you move safely, smoothly, and on-schedule, so you can settle right in and start living your greatest Boystown life.